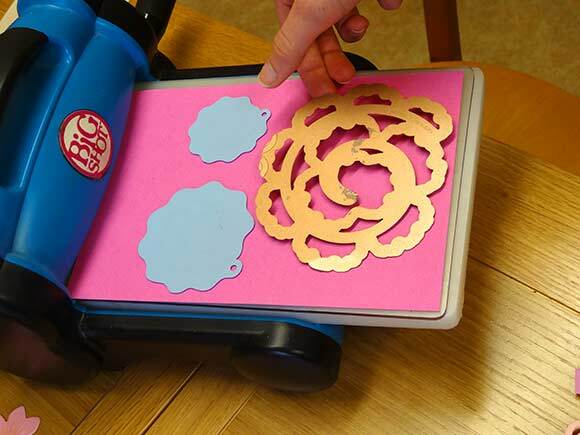 I have used a template cutter to press out the spiral shape that I used to make the roses, but you can achieve the same effect by cutting out a circle and then cutting out the spiral shape from within the circle. 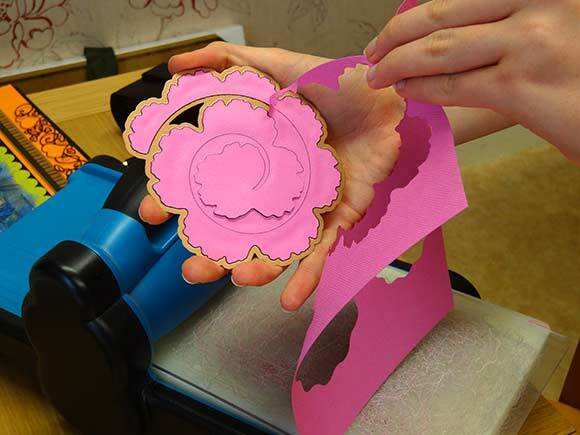 Take the spiral shape that you have cut out from your piece of card or paper and remove any excess paper. 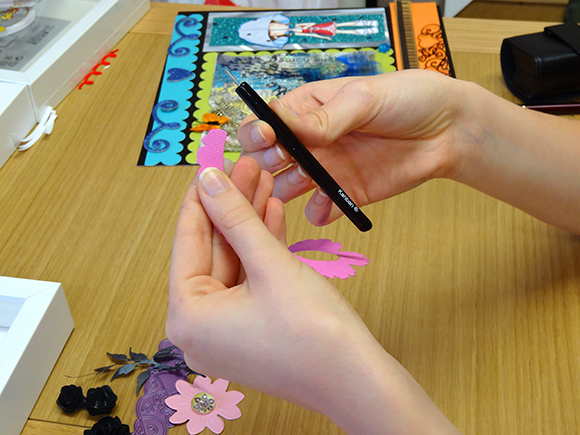 Now I use my Mum’s quilling tool which has a split end that you can thread the paper into in order to help you twist the paper into shape. 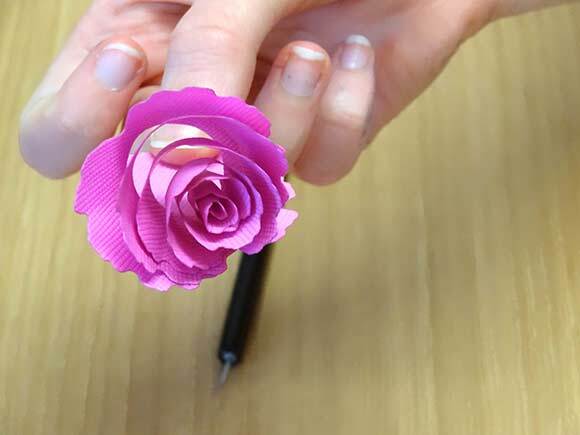 You can get the same effect by twisting the paper spiral around your finger but it is easier and quicker with a quilling tool. Hold the paper quite tight as you twist it in to shape. 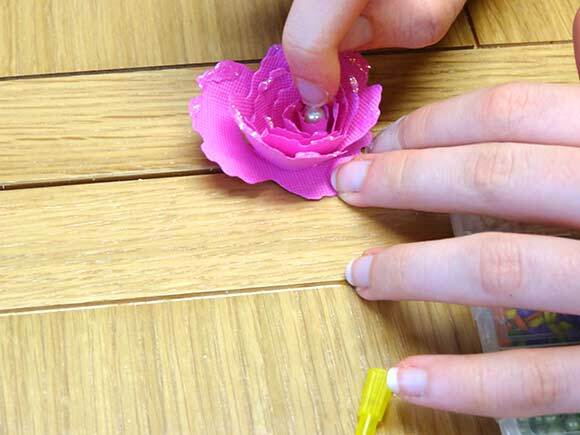 When you get to the end of the spiral you can remove the quilling tool or relax your grip if you are using your fingers and you will get a loose rose as in the following picture. Now you need to glue the tight end of the spiral together to form the base of the rose. 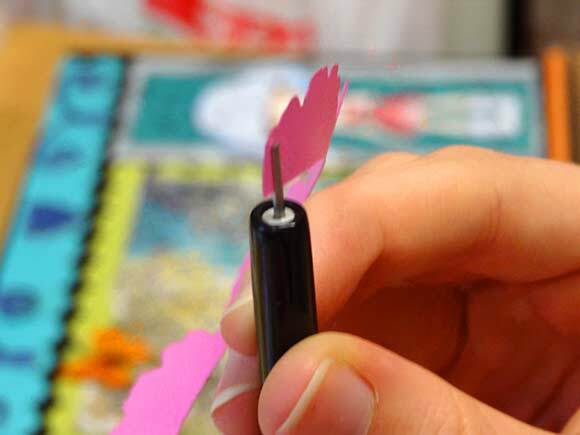 You can use any good quality paper glue but preferably one that dries transparent. I used a hot glue gun for speed but on a couple of my earlier roses I forgot that a hot glue gun is HOT 🙂 ( you may catch sight of a plaster on my finger ). I have used a bottle of glitter glue just to highlight the edges of the petals. Finally I glued a small bead into the centre of the rose for that little something extra. Here is the finished rose:) and a few I made earlier in the week. Finally to finish off here is another picture that I managed to complete yesterday and I would be interested to hear what you think. The frame is only 9 inches by 9 inches but I hope that along with the others they will brighten up my walls. If you click on the picture or tap it you will see that I have loaded a full size picture which you can see more detail in. I think that no matter how old one is, glitter glue makes one young at heart — good job. You are so right Bill, if I ever feel like not going to a party just putting on one of my glitter dresses puts me in the right mood. I can’t wait to see if the glitter glaze dried well on my wall too. Those look good. Thank you for showing step-by-step of how to do this. Thank you I hope you have a go friends love them on cards :). You can use cold glue too you just have to hold them for longer. Glitter glue and pretty paper too … you can’t miss. 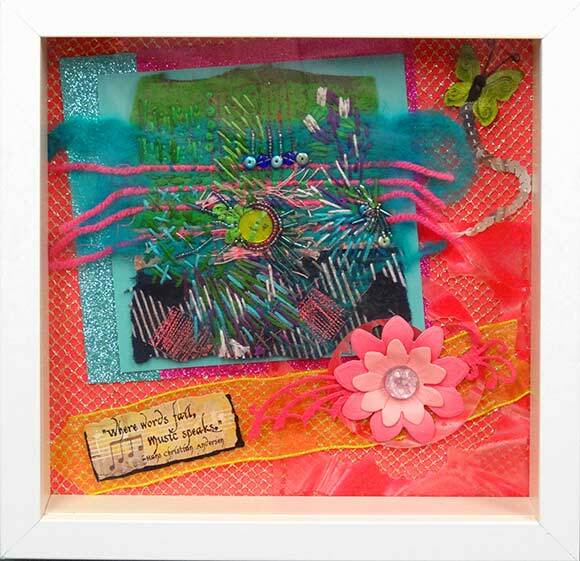 And I especially like the collage piece. Thanks for sharing, Charlotte. Especially love the rose with the pearl in the centre. Think I’m too clumsy for this though! Honestly you can’t be more clumsy than me 🙂 when I got a blob of glue of my finger tip I made it worse by rubbing another finger over it and hurt that finger too:). Once I got the hang of it I was fine though and I’m quite quick now. Great photos of this process…very well done! Thank you, I loved your family photos especially the water skiing ones. I agree with dalo2013 that the photos and description of the process are great. If you hadn’t told us, I never would have guessed that this was the first time that you did one of these guides. It was my first attempt so I’m glad it was clear, thanks Sheryl. I had no idea there was such a paper punch as that! 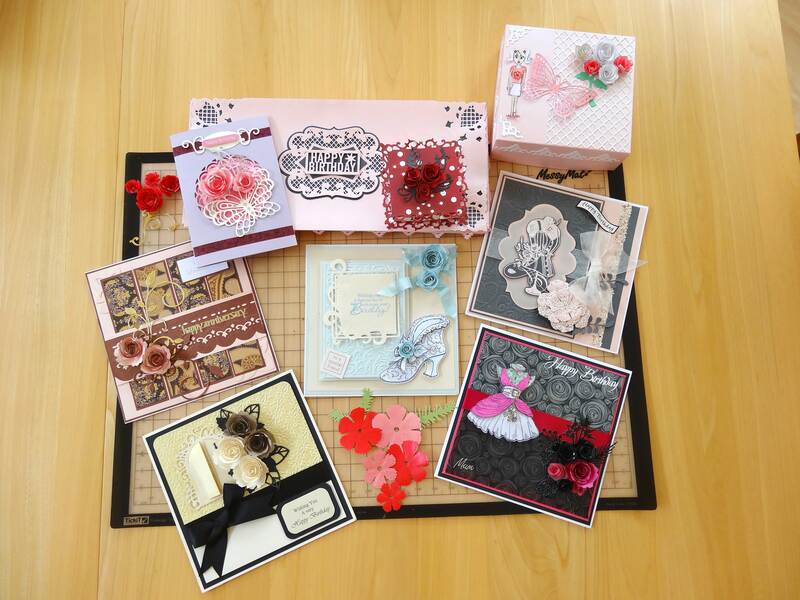 It’s so exciting when Dad buys Mum a new punch for her birthday or Gill lends us her phenomenal collection of dies. 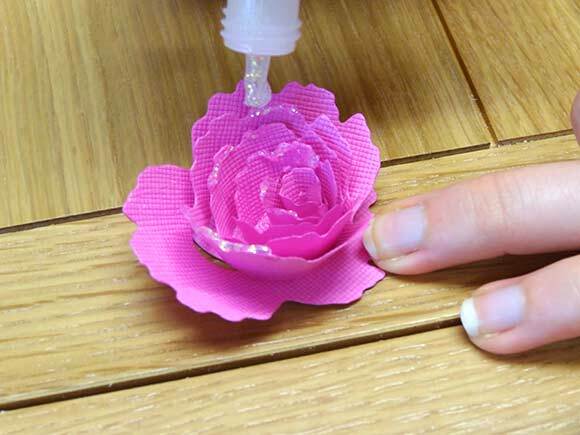 Check out this awesome tutorial for paper roses that I found. These roses are so cute. I think I’m going to have to make some of these. If I were to, how do you think I should use them? Anyone else as inspired as I am at this tutorial? So pretty! Hi Lauren, I have put some examples of how to use the roses at the bottom of the post, thanks for asking. 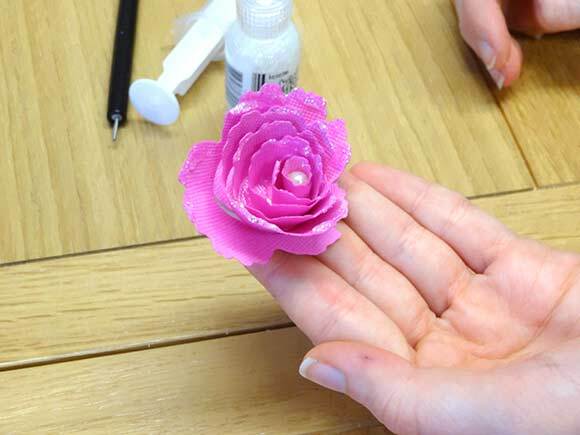 What a great idea to use the quilling tool to help make the roses. Looks like an interesting project. Very cool idea! Easy to follow instructions too! Thank you, I hope you have a go, you can use any paper. I can’t really recommend Marie Osmond’s performance of “Paper Roses.” But I’m certain that you would do a great job on it! 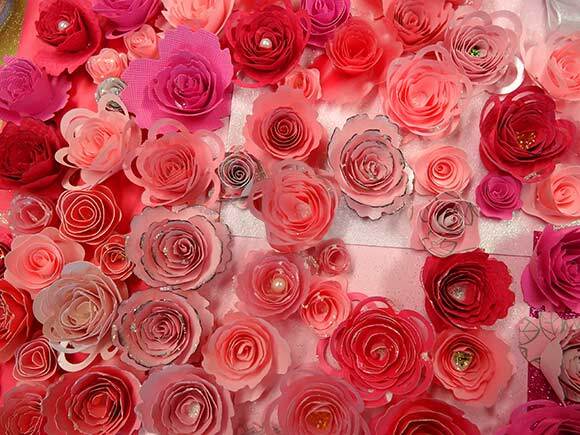 i love these paper roses! you make it look so simple. i cant wait to try it! also love the collage 🙂 thanks for sharing your step by step!! Thanks Amanda, I love that you’re making your own clothes. 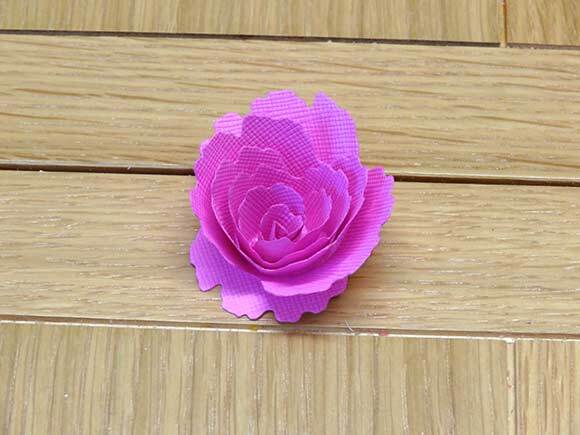 You should make some of the roses out of fabric remnants and fabric glue or stitch the bases, in fact I might try that myself to try and make a brooch. Haha! They were my exact thoughts when I saw your roses! 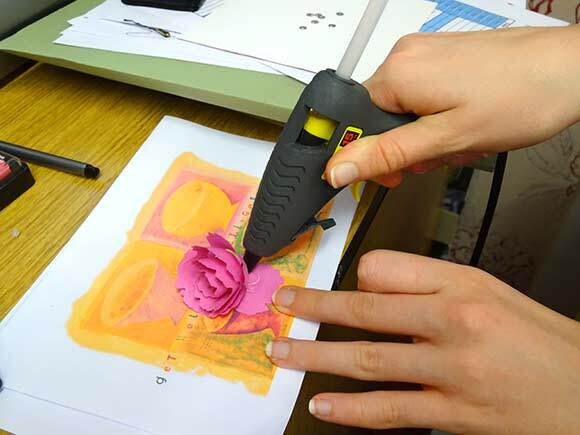 I am not sure i could cut them out as beautifully as your cutter though and that makes the difference! Would be a fabulous outfit though if it had them on! very nice. Thanks for the step by step. Hi Brin, I like the idea of making my own tomato jam from your last blog post. A great idea for very ripe tomatoes. That’s nice Barbara – thank you. You have no idea how much of a mess I would make of that! I’m in awe of people that can do stuff with their hands. Thanks for looking at my blog. That’s kind. Your brother’s work sounds interesting. Something like that on Swindon would be good I think. I’m about to write a travelogue based on the West Swindon sculpture walk and an imagined guidebook entry on the Magic roundabout for my university coursework. I have a couple of friends who also like a good singer. I must remember to tell them about your blog. I meaning to. Wow what a fantastic idea! I love all the shades of pink together too, I could even try making these on a cake! Hi Phillipa, I bet these would look brilliant in icing great idea. Simply stunning but a lot of skill and nimble fingers involved here. Well done Charlotte. So uplifting and thanks for sharing. I need some black roses for my packaging and this may just do the trick! Hello Mary, thanks for visiting and your lovely message, I enjoyed your paintings too, iconic London buildings in other beautiful surroundings is a brilliant idea. Sometimes the new buildings are fantastic but when they overshadow buildings that are works of great art is like putting a curtain over the Mona Lisa. Thanks again and look forward to more of your posts. Thank you for the reblog I am grateful. Thanks for sharing! I make handmade cards for my close friends and think adding a few paper roses will be a great extra oomph! Way to go! Hi Hajara, the blue circles you see on the top picture are just wavy spirals, nothing as fancy as the larger die, and they make the pretty smaller roses you see in the photograph :). Good luck just watch that hot glue! I am an art teacher and these are really COOL! I know it’s been a while, but life got in the way. Anyway, those roses almost looked real from far away. I’m not much good at arts and crafts, so to me those roses look amazing. Hi Rawle, I’m just pleased you found the time to pop back :). Are you still studying full time? I’m back the week after next I can’t wait. I’m studying and I’m working, so I can’t hang around the internet as much. I’ll still pop back in occasionally, though. They are gorgeous! Great pics,too. Thank you, I love your luxe blog :). You’ll have to check out my future post about my homemade sparkle wall and let me know what you think. Hi Charlotte! I have been looking for that post but have been unable to find it! Could you give me the link? Hello! Thanks for stopping by my blog and following it =) =) I really love yours, you’re incredibly creative and these are BEAUTIFUL! Hello Penny, good morning, I’m glad you like them you could add them to your fabulous pink box to keep on your dressing table. Your roses are beautiful! I’m sending your website info to my granddaughter who has a Big Shot and loves to make beautiful things. 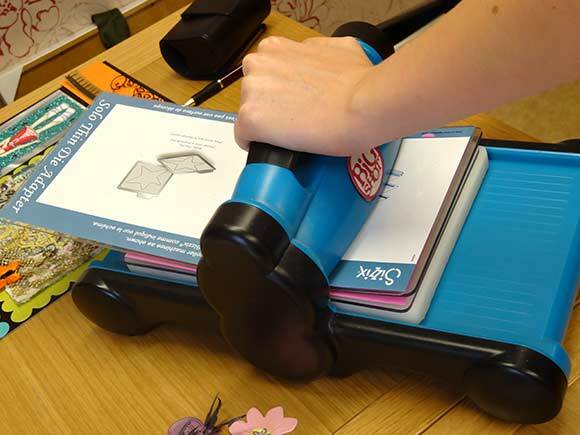 Hi Donna, I still like using the Big Shot, my Mum progressed to a Joy because you can use A4 paper sizes. I saw a plain photograph frame this morning and thought the roses would look good around that. These are beautiful! What wonderful pieces! Thank you so much as well! I can’t even begin to pick one, I love acrylic and watercolor because they’re fun to use and easy to clean up, but oils have their advantages as well! Can’t wait to see more of your projects! Hi Elizabeth, thanks for reblogging my post, that’s a lovely compliment. Brilliant step by step instructions. Like the ones with the pearls in the center best. I love the picture that you made too. Great quote. Hi Joshi, thanks for taking the time to visit and leave your lovely message. Is Tota your first name? Is it cold in Iceland right now, how lovely to connect with someone from there, I’ll check out your blog again to discover more. Yes, well Tóta is my nickname. Right now it’s cold, yes. Real storm out now, no snow yet though. Love your nickname, we had a lovely sunny day in Scotland yesterday but not so good today. I’d love to visit Iceland one day. Oh wow how pretty! I have got to try this! You could try it in icing sugar, that chocolate cake looks delicious. Wow, this is good craft. I’ll show this to my sisters. Thank you for dropping in and taking a look at my blog, I hope your sisters get chance to have a go. Thank you for reblogging the post I appreciate it. Wow! So much attention to detail! I love your creativity. I love to put my music on loud and craft, thank you for your lovely message. I so want to try this!! Beautiful!